This Eclipse plugin interprets the ANSI escape sequences to color the console output. It works for output text with escape sequences directly from Java, Groovy, C/C++, Perl, Python, or any other Eclipse hosted language that outputs text to the standard output. By adding the following code below to your website you will be able to add an install button for ANSI Escape in Console. I love the pluggin, works great, except for 1 small issue. With ANSI Escape in Console enabled the blue underlining for the stack trace hyperlinks no longer show up. You can still click on the text and it will take you to the spot in the code but new users do not know it is clickable because it is no longer blue or underlined like it is by default when ANSI Escape in Console is not enabled. Is there a way to have the blue underlining still display properly via ANSI Escape in Console? I tried to add ANSI formatting around it but that breaks the hyperlink. Works great! Thanks for releasing and maintaining this! When I drag and drop the install button on my Workspace all I get is a blank (standard) Eclipse Marketplace window opened. I know it omits 4.10 support, but I know the Spring Tool Suite based on Eclipse 4.10 has it, so I thought I'd manage to get it working. Can you please give it another try? I have uipdated the URL, making sure it does not end up in a redirect. Now the logging of my SPRING BOOT application is no longer scrambled with ANSI control characters. Exactly what I wanted. The plugin appears to modify the standard console view, instead of adding a new view. No need to (re)configure anything. Unable to read repository at http /www.miha i-nita.net/ eclipse/content.xml. I switched to a different version of Eclipse and was able to install from the Marketplace to that version's plugins directory. I copied the JAR file to the plugins directory of the version that failed to load and it works. Does not work properly with multiline coloring. I have about 30 lines of output from c++. Let's say the line 10 is the sequence of red color. Then 3 lines that should be red and the code for restoring the default color in the end of the third line. Other lines should have default color. With such output I've got red in different places while scrolling the eclipse's terminal. Sometimes red are first 10 lines, sometimes last part of the text. May be the plugin works only if setting and restoring sequences are localized in the same line? Unfortiunately, a known problem, and one that I don't really think I can solve. I am also anoyed by this bug, I have some idea. But is very hacky, but it might also mess up the performance. Could you notify us whenever you have a new release of "ANSI Escape in Console" for Mac OS High Sierra? I am using Eclipse C++ in Mac OS High Sierra. It seems this pluging removed a part of messages in the console. Spring Boot applications that log using ANSI color codes won't display on the eclipse console. If the text is copied from the console to another app (say Terminal), you can read all the text. It is as though the text is rendered in the same color as the background color of the conole. This seems to be a system / SWT problem. 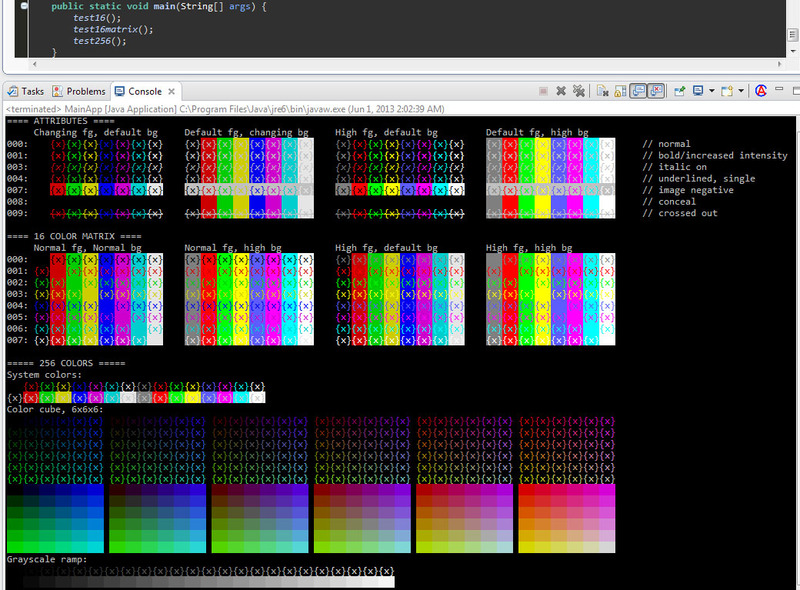 Can anyone look into this Please..
ANSI-coloring during build ROS groovy projects? Hi, is it possible to turn on also ANSI-coloring during build in build console for ROS groovy projects? Sorry, I don't have an Ubuntu installed (just Win and Fedora). I have found a VM, and I can try that. Since Eclipse needs to capture its output, it starts the build with the stdio and stderr redirected. And that makes sys.stdout.isatty() return False (because the Eclipse console is not really a terminal). It looks like there is no way to get around this without code changes. But you can just comment these two lines and it should work. Anyway, if commenting the "if not sys.stdout.isatty():" does not work, please let me know, and I will go ahead and try top setup a working ROS environment. I don't know, I have never played with ROS. Let me give it a try, and will get back to you.